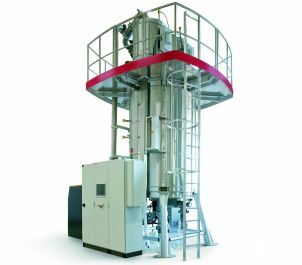 At the ongoing Plast 2012, Starlinger & Co GmbH and the divisions Starlinger recycling technology and Starlinger viscotec is displaying its deCON 50 decontamination dryer that dries and decontaminates PET post-consumer recycled (PCR) flakes in one single step. Developed by Starlinger viscotec, the deCON 50 can be used as a stand-alone or inline unit that both dries and decontaminates crystallized PCR flakes or skeleton waste according to European Food Safety Authority (EFSA) and the US Food and Drug Administration (FDA) standards prior to the extrusion process. The first-in-first-out principle, the company said, guarantees the same treatment time at the same temperature for each single flake, resulting in strong decontamination without peak levels. Starlinger viscotec furthermore supplies solid stating and decontamination equipment for the production of food grade HDPE flakes. The newest machine development is the turnkey PET sheet line viscoSHEET for the production of 100% food grade rPET sheet. As said, it can process up to 100% of undried material with no or just a minimal intrinsic viscosity (IV) decrease. Starlinger is also presenting its range of technology solutions for the production of flexible woven plastic packaging at Plast 2012, currently running in Milan, Italy until May 12.